Hooray, tomorrow is Friday! And I took a huge chunk out of my Christmas shopping today! I’m trying to have it all done before December to stress less and enjoy the festivities, sounds good in theory – right? 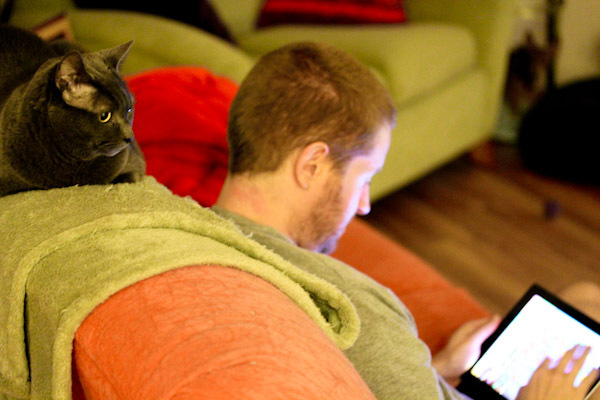 Smokey is not impressed with our Candy Crush obsession lately. Did you know if you time out on a level on one device, you can just keep playing on a different device without waiting? 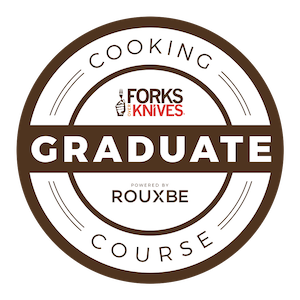 Okay, maybe I need to slow down a bit and spend some more time creating in the kitchen. Lately hubby has also been obsessed with Sriracha sauce like the Rosewell kids with Tabasco adding it to just about everything. So I decided to use it in a simple quinoa dish with a slightly sweet and spicy flare. 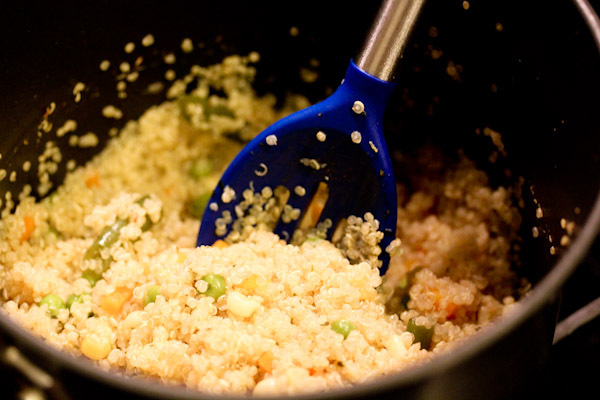 Bring water and quinoa to a boil in a medium saucepan. Reduce heat to a high simmer and stir in the rest of the ingredients. 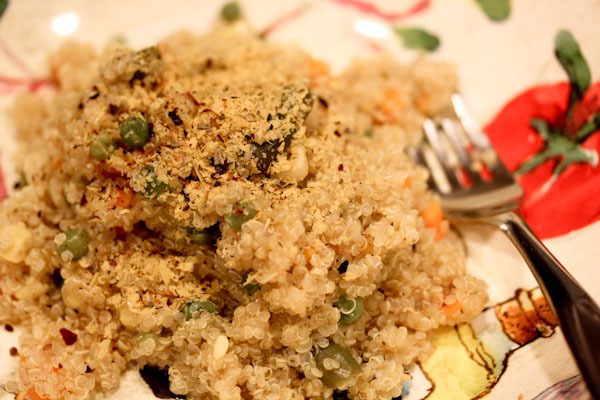 Simmer for 20-25 minutes, or until liquid is gone and quinoa is fluffy. Serve and enjoy. Makes 2 large or 4 small servings. I’m terrible when it comes to keeping fresh cilantro, it never seems to last in our garden or fridge like basil or other herbs. 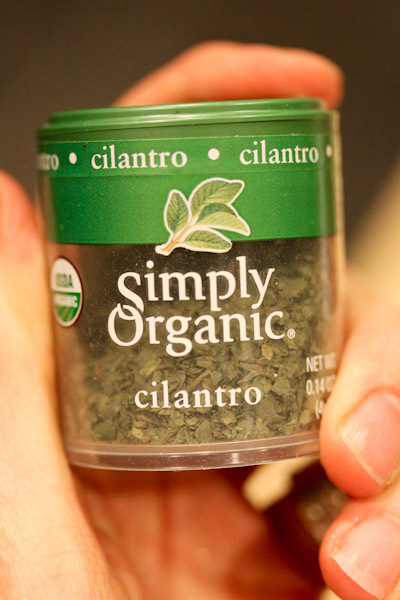 But this little container of dried cilantro I picked up from Whole Foods has been going a long way. 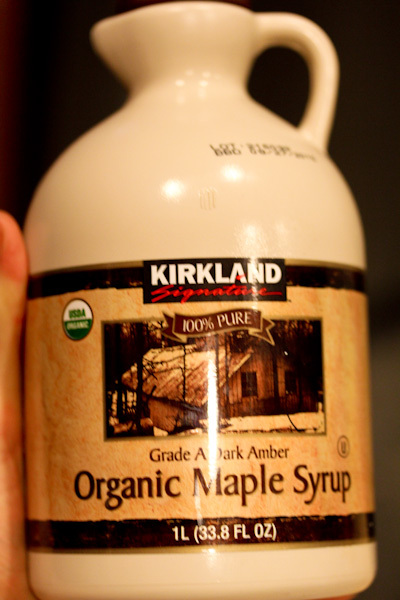 And I used this organic maple syrup jug from Costco. It’s a small investment, but a treat to have on hand for holiday recipes. I used a blend of Trader Joe’s frozen organic veggies for this recipe. 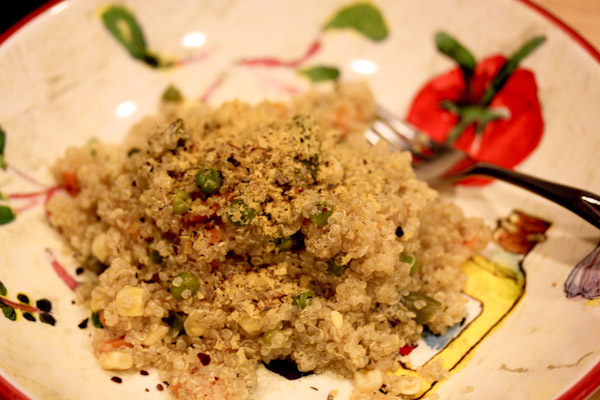 The fast cook time of quinoa is so perfect for weeknights and adding these ingredients to a saucepan is fast with minimal chopping or prep, I was able to empty the dishwasher and feed the dogs while it simmered. I made a Buffalo Sauce the other day! I blogged about it today, actually! LOVE Smokey! She’s so sweet! Just want to snuggle her!